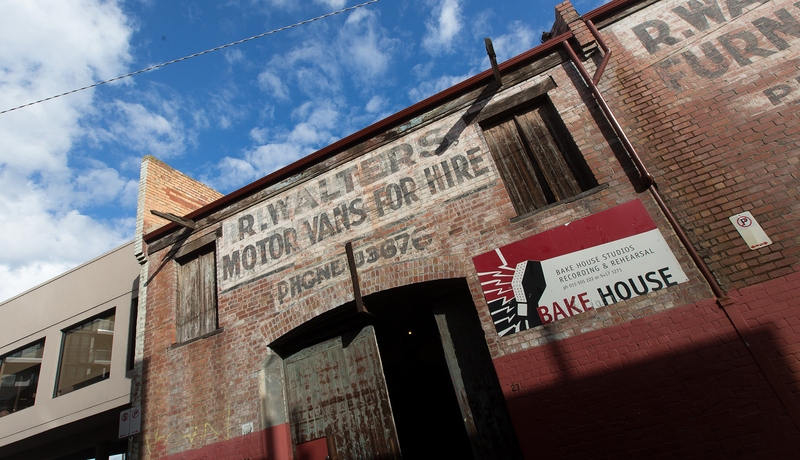 From its humble beginnings down a bluestone lane in North Fitzroy to its landmark, award-winning spaces on Hoddle Street, Bakehouse Studios have been at the heart of Melbourne’s localand international music scenes for over 25 years. Around 400 musicians pass through Bakehouse every week, from solo singer-songwriters and kids having their first jam, to grassroots local regulars and an array of international touring artists as diverse as Tool, Missy Higgins, Olivia Newton-John, Beck, Ed Sheeran, the MC5, Cat Power, The Cat Empire, Vance Joy, The Smashing Pumpkins and Judas Priest, as well as Bakehouse favourites The Saints and The Drones. In October 2013, owners Helen Marcou and Quincy McLean received an overwhelming response to their tribute to Lou Reed through two giant posters on the front of their iconic studios. Since then, the wall has become a permanent exhibition space, viewed by up to one million motorists per week. The success of the public art project soon sparked a new idea for visual artists to reimagine Bakehouse’s interiors with immersive installations in the old rehearsal rooms, with these rooms now featuring the handiwork of artists such as Patricia Piccinini, Julia deVille, Mick Turner, Peter Milne and The Hotham Street Ladies.